Child Support is more than just Money! Information presented by Kathy Shaw, Janus Solutions. A NJ State contracted trainer, Kathy will make a presentation of the Rights and Responsibilities of the Ex-offender, Thursday, October 22, 9:30am to 11am at the United Way of Greater Mercer County Conference Room, 3131 Princeton Pike, Building 4, Suite 113, Lawrence, NJ (Go to the glass door). Light Breakfast is included! Thursday, November 5, 2009 - 8:30 a.m. to Noon at The Conference Center at the New Jersey Hospital Center – 760 Alexander Road, Princeton, NJ – Breakfast is included. There is no charge, but registration is required and starts at 8:30am. 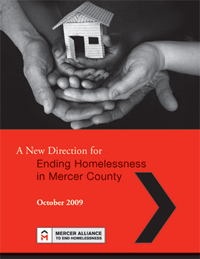 Mercer Alliance Releases "A New Direction for Ending Homelessness in Mercer County"
Click to download a copy. It is a large file. 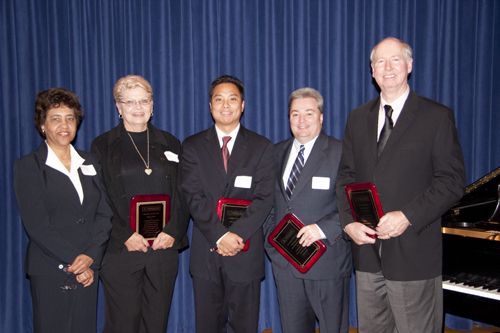 The Alliance was please to Honored as Volunteer of the Year, Kathy Shaw; as Landlord of the Year, Rob Rubiano; as Affordable Housing Champion, Mayor Mildred Trotman; as Media Champion, Brian Malone, The Times of Trenton; as Corporate Champion, Fred Egenolf, Bristol Myers Squibb; and as Legislative Champion, Rep. Reed Gusciora at the Thursday, October 8 event. We are thankful for all their support. To be a volunteer tax preparer, you must take and pass the IRS test. We have changed our training this year. There will be a short 2 hour session, followed by individual self-study with support and then a longer session where you will receive practical knowledge in tax law, and TaxWise software use, as well as hands-on practice completing tax returns. Choose either Wednesday, December 2 @ 7pm OR Saturday, December 5 at 10am. Sign up for the first session today. Additional training times may be arranged for interested individuals. Mercer Alliance is raising money to help all people experiencing homelessness to get a photo ID. Experts estimate that the cost to obtain proper photo ID for an individual is between $50 and $100. The homeless person often never had these important documents or has lost them. A photo ID is needed to enter Federal buildings, ride the railroads and to apply for many benefits and services. Tarry Truitt, Communications and Project Manager, ttruitt@merceralliance.org or 609-844-1008.